This is the age range where tummy time is very crucial to symmetrically strengthen neck, upper body and trunk to start rolling, sitting, crawling and eventually walking. A strong core plays a big role in this age range to progress towards proper posture while sitting and walking, which would aid in other physical activities in order to keep up with peers in school. Unforeseen injuries and orthopedic issues arise within this age range which are mostly due to muscle imbalance caused by tightness on one side and weakness on the other. Blooming Steps Physical Therapy provides therapy to help enhance the lives of pediatric patients. We specialize in treating patients in varying age ranges. We know they need different interventions and provide it for them. Our physical therapy programs are led by Pamela Vartanian, PT, DPT, PCS, who is a board certified specialist in pediatrics in physical therapy. We have more than 10 years of experience helping pediatric patients improve neurological/ orthopedic issues and developmental delays. Follow on Instagram › . We are conveniently located in Sherman Oaks, CA. Feel free to stop by or schedule an appointment. 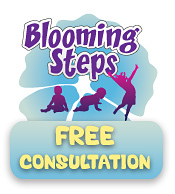 Blooming Steps Pediatric Physical Therapy specializes in Children's Physical Therapy. We provide physical theraphy for children of all ages, including Infants, Toddlers, Kids, Pre Teens, and Teens. Our staff of Pediatric Physical Therapist can help with a variety of issues and developmental delays. results. Located in Sherman Oaks in Los Angeles County, around Encino, Van Nuys, Studio City, Tarzana, in the San Fernando Valley.